The competition regulator says it has found evidence that supermarkets are misleading customers with confusing pricing promotions. After a three-month study, the Competition and Markets Authority found some examples that "could be in breach of consumer law". The investigation came after a complaint by the consumer group Which?. The supermarket industry said the vast majority of offers represented a good deal for customers. In its "super-complaint" which triggered the CMA's investigation, Which? said that it had found hundreds of examples of "misleading and confusing pricing tactics". However, the CMA said that although there was evidence of misleading pricing, the practice did not appear to be widespread and retailers were generally taking compliance seriously. It said it would now investigate further and that, in some cases, fines could follow. "We have found that, whilst supermarkets want to comply with the law and shoppers enjoy a wide range of choices, with an estimated 40% of grocery spending being on items on promotion, there are still areas of poor practice that could confuse or mislead shoppers," said Nisha Arora from the CMA. Unit pricing. This is where products are priced per gramme or per litre, to make comparisons easier. But not all products use comparable size/weight criteria. The CMA said there should be greater clarity around this issue, and that shelf labels should be more legible. "Was/now" promotions, or reference pricing. This is where a new discounted price is compared to a price charged previously. But, by law, the period of reduced price cannot exceed the period of the higher price. The CMA said it would be working with shops to make sure they stayed within the rules. As part of its investigation, the CMA examined the pricing on 150,000 products. Of those, it said that 800 had potentially misleading prices. It said it would now be talking to businesses in more detail about the problems, and issuing fines where necessary. It also recommended that the guidelines on pricing should be updated. Alex Neill from Which? told the BBC: "We are pleased to see that the CMA hasn't ruled out taking action." However, the supermarket industry said the Which? complaint had been shown "not to hold water". "Within the Which? super-complaint there have only been a relatively small number of confusing, or erroneous, prices identified," said Tom Ironside, the British Retail Consortium's director of business and regulation. "The vast majority of these offers are an extremely good deal," he told the BBC. 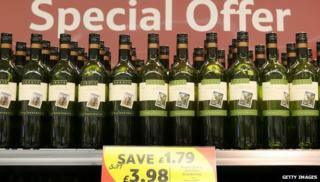 A 2 litre bottle was advertised at £1.98 for 28 days, but the price was then lowered to £1 for 63 days. It was advertised as "was £1.98". The rules say such price promotions cannot last longer than the higher price period. Some bottles are priced "per 100ml". Others are priced "per 100g", making price comparisons difficult. Some consumers said they agreed with the CMA's findings. "The pricing of fruit is one that really annoys me," said Tony Kenny, from Leicester. "Take apples, for example; some are priced per kilo, other are per fruit, making it impossible to compare prices." Others felt the regulator should have been tougher. "There should be heavy fines imposed for blatant and persistent misleading of the public," said Martin Cohen. The Retail Ombudsman said that 1% of the complaints it received were about pricing offers in supermarkets. "The problem is that the current rules are merely guidelines, which present retailers with a lot of wriggle room," said Dean Dunham, the Retail Ombudsman. "What the report really highlights is a total lack of regulation in this important area."